The Silence Plus is, with regard to appearance, a fairly conventional platform. It is comprised of two surfaces with a layer of Thixar's gel between them. One of these surfaces comes in direct contact with the environment i.e. a shelf, or whatever is chosen by the user to place an audio device on, while the other supports the device. The gel between the two surfaces provides the necessary isolation. 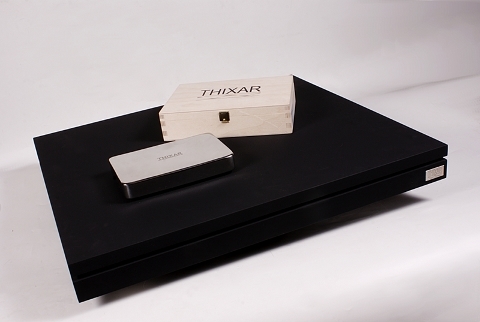 Both parts of the platform are made of MDF, which is carefully finished, in the case of the sample we had for review, in the Thixar's classic matte/gray color. Other options, including carbon sheet or even custom materials like various varnishes and/or natural wood) are available upon request. Interestingly enough, Silence Plus does not use any kind of spikes or cones for support and the company does not recommend them. That being said, the bottom surface has threaded holes and Thixar offers such accessories if one thinks that some experimentation is in order, here. The total height of the Silence Plus is 48 millimeters, but its two surfaces are asymmetrical with a ratio that appears to be close to 1: 2, with the lower being 36mm high and the upper 18mm. Silence Plus is available in two dimensions, the "medium", M, (450x360mm) and the "large", L, (500x440mm). Weight is quite large, 7.4kg and 10.6kg respectively. The use of Silence Plus is, more or less, obvious: The material between the two surfaces suppress the vibrations related to the environment (those normally transferred through direct coupling to the floor). Thixar, however, explicitly states that the construction is particularly effective in suppressing endogenous vibrations too, that is to say vibrations generated either by the device itself (due to its mechanical parts, transformers, or other components), or transferred through the air (airborne vibrations, some of which may take the form of acoustic feedback from the loudspeakers). 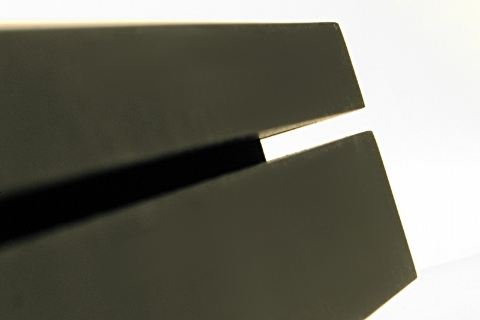 Silence Plus is based on a fairly standard architecture, where two surfaces are separated by some damping material. The secret of Thixar is, of course, the kind of gel they use. The Eliminator is a different approach to vibration control and suppression and the basic idea behind lies in the importance of damping when applied directly to the chassis of a device and especially its cover, i.e its exposed horizontal surface. This surface can be in the form of a single slab or have the familiar u-shape, extending on both sides. In practice, Eliminator is a mass with a cross-section in a shape of a parallelogram, normally placed at the point of maximum movement of the surface to minimize its vibrations. As in the case of Silence Plus, one component of Eliminator's operation is obvious: Adding mass to a system with some elasticity, in the worst case, decreases its resonant frequency and, at best, weakens vibration to the point where it is negligible in terms of its effect. 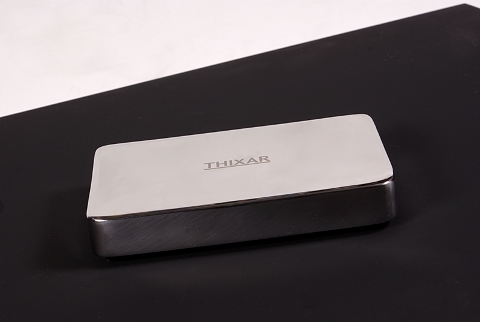 Thixar says the design of Eliminator has other aspects too, such as optimizing the vibration transfer to the mass (the interfacing between Eliminator and the device, that is, implemented through a slightly sticky bottom surface) and its very structure, which, in addition to the apparent external polished metallic surface, has a form more complex than expected, including a version of the already discussed gel, though the company avoids giving much detail here -for obvious reasons. Here, the layer of the damping material between the two MDF surfaces is clearly visible. The Silence Plus is handcrafted at the company's plant in Düsseldorf, Germany. Up to this time, the Eliminator is available only in one size/weight combination. 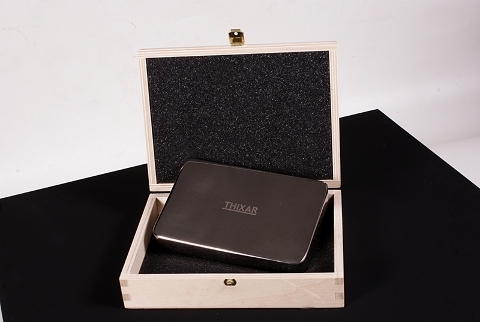 The photo shows, also, the packaging, a well-made wooden box. The dimensions of the Eliminator are 150x100mm (width x depth) and its height is 25mm. 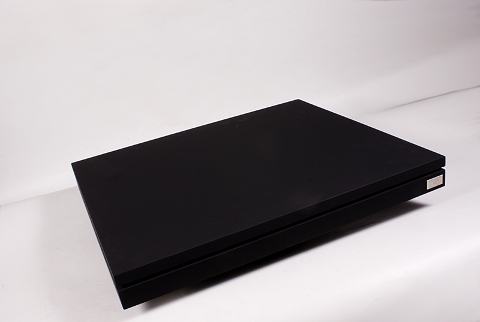 The weight is large enough for its volume, at 1.6kg, but not excessive to deform the surface in which it will be placed on, even if it is of medium durability. Thixar has ensured that Eliminator is a particularly attractive accessory. Its prominent part, the top surface, is made of perfectly polished metal, its corners and edges are rounded and the overall look exudes a feeling of luxury. It is delivered in a well-made wooden box. Eliminator's finish is particularly good in quality and feel. Thixar says that its internal structure includes their proprietary component, which -in conjunction with its mass and bottom surface pile- is responsible for suppressing the chassis vibrations.